What’s worse than experiencing chronic or recurrent muscle pain? Not knowing the cause or how to treat it. If you’re experiencing pain of unknown origins, you know how frustrating this can be. After turning to medical professionals to figure out what’s wrong, all the tests come back normal. There may be no physical signs of tissue inflammation. But you’re still in pain. You could be suffering from chronic musculoskeletal or neuropathic pain caused by nerve irritation or nerve dysfunction. When nerves are malfunctioning, the muscles they are connected to can become weak, tight and shortened—translation: painful. You feel like your muscles never relax. Even without knowing the root cause of this pain and the stiffness that often comes with it, your symptoms or condition could be successfully treated with what’s known as intramuscular stimulation or IMS. Vancouver-based physician Dr. Chan Gunn developed IMS in the ‘70s and now offers training and certification for other medical professionals at his Institute for the Study and Treatment of Pain (ISTOP) at the UBC Gunn IMS Centre in the Division of Sports Medicine in the Faculty of Medicine at the University of British Columbia. If you’re experiencing pain and symptoms with no or minimal signs of tissue damage and inflammation, IMS could be the right treatment for you. IMS treatment involves the insertion of acupuncture needles into tight muscle bands or close to the spine to target a compressed nerve root. The needle creates a tiny therapeutic injury, causing the muscle to grab onto the needle and cramp. This type of stimulation triggers a spinal cord reaction, allowing the muscle to finally relax and the nerves to function normally. The small wound also increases circulation, telling the body to send blood and healing materials and encouraging the healing process along that tightened muscle band. Each IMS treatment is cumulative, providing restoration to the muscles until the entire area is healed and free of pain. Intramuscular stimulation risks: Does it hurt? Most people describe IMS as unpleasant but not painful. The treatment itself does not last very long, with the needles sometimes inserted for only a few seconds each. However, because the intent is to stimulate the muscle into relaxation, there is often discomfort before the rush of pain relief—some people experience this right away in the session, while others experience the relief a few days later, in addition to increased movement and function of the muscle. After receiving an IMS treatment from your physiotherapist, you may experience some soreness in the area, but it is usually mild and goes away within 24 hours, leaving you with less pain and more functionality. Since IMS specifically targets chronic musculoskeletal pain, it’s not an effective treatment for other types of pain such as chronic inflammatory pain caused by rheumatoid arthritis, cancer pain, metabolic neuropathies (i.e. diabetes) and degenerative neurological conditions (i.e. Parkinson’s disease). IMS is not a recommended course of treatment if you are pregnant, have had a recent surgery or local infection. The number of IMS treatments you will require will depend on the severity of your condition, how long it’s been going on, how much scar tissue has developed and your body’s own self-healing rate. The number of treatments you require will depend on several factors such as the duration and extent of your condition, how much scar tissue there is and how quickly your body can heal. People with more recent pain often see results faster (1-2 treatments), while others with deeply rooted pain that has developed over a longer period of time often need more (6-12 treatments). To allow the tissue to heal in between treatments, your physiotherapist will likely schedule your appointments at least one week apart. Any aches or discomforts experienced after treatment are normal and can be relieved by staying hydrated, soaking in a warm bath or by applying heat. IMS and acupuncture may seem similar because they use the same instruments, very fine needles. However, the two are quite different techniques. 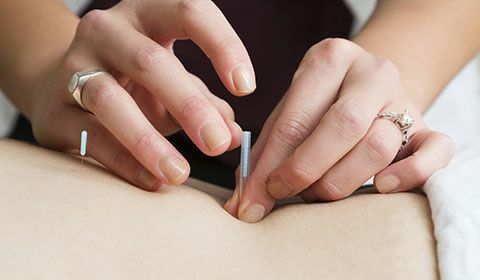 Acupuncture is a technique that stems from Traditional Chinese Medicine practices, focusing on meridians of energy that run through your body and the effect they have on different organs, muscles and more. An acupuncturist will insert a series of needles around a certain point and leave them in, typically for around 10-20 minutes. People often describe the acupuncture experience as calming and relaxing. Combined with other forms of physiotherapy, acupuncture can be a very effective treatment for acute pain or ongoing inflammation. While acupuncture has been around for hundreds of years, IMS is a relatively new development that is based on conventional western medicine physiological and anatomical knowledge. It specifically targets areas of chronic pain and muscle dysfunction. Those areas are identified by your physiotherapist during an initial assessment and then stimulated by a needle that is left in for only a short time. While acupuncture can be relaxing, IMS is often a more intense experience. IMS is not better than acupuncture. It’s just a different technique used to treat different conditions and types of pain. Will IMS be covered like the rest of my physiotherapy? Since a trained physiotherapist conducts your IMS treatments, the costs associated are often the same as other physiotherapy treatments. Be sure to check with your insurance provider before starting treatment.